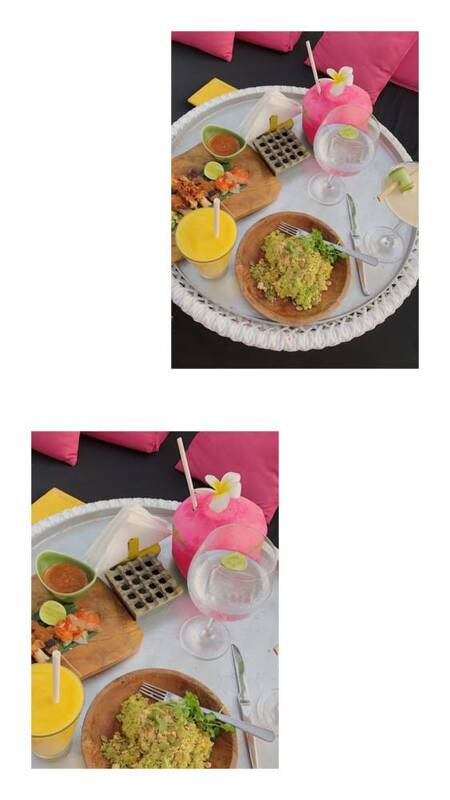 If you’re looking for the best luxury beach resort hotel in Seminyak Bali, look no further. 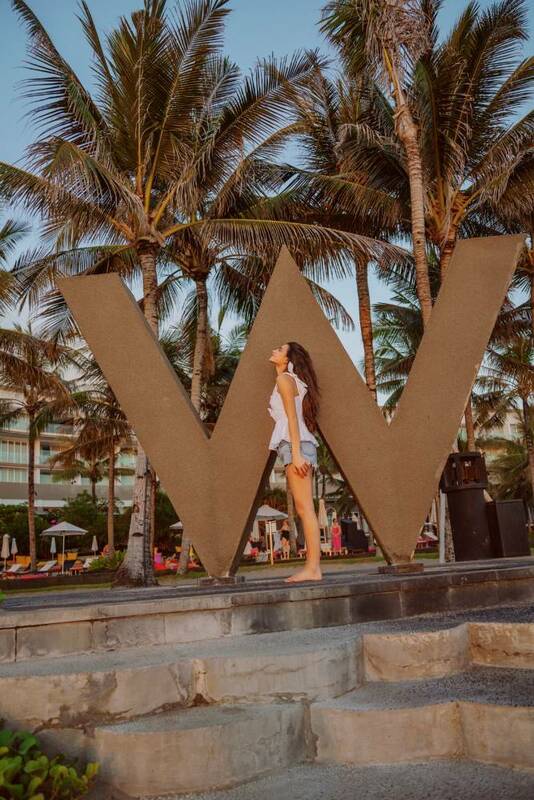 The W Bali is Seminyak’s most trendy & contemporary hotel located right on the beach where you will see one of the most beautiful sunsets of your entire life. 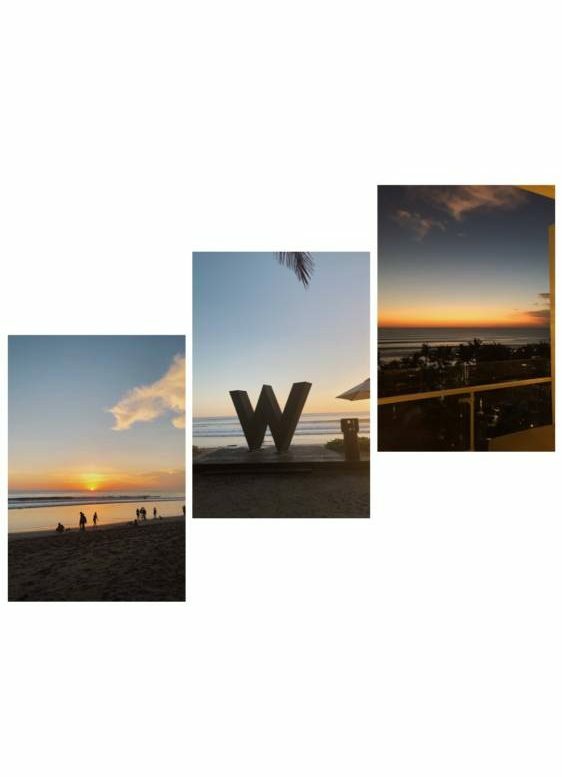 The W Bali is the epitome of luxury accommodation with a modern twist. Our stay was truly unforgettable and I highly recommend this place to you guys. 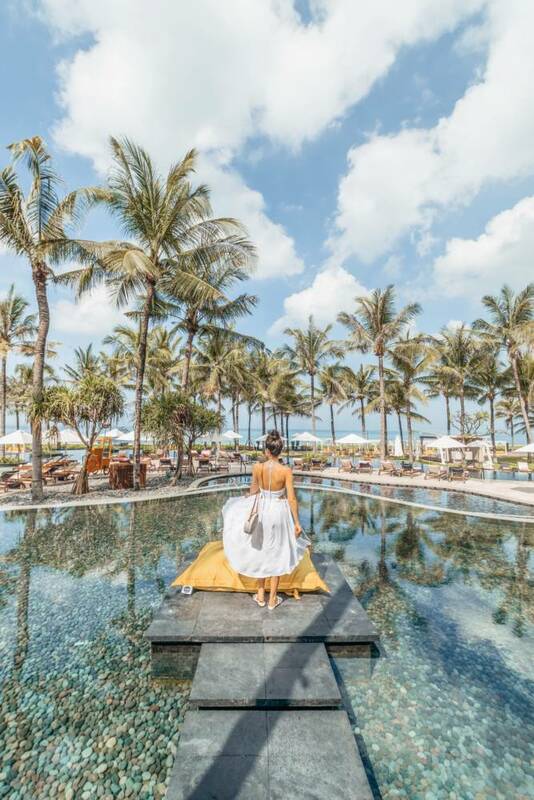 Keep on scrolling to see more of the best luxury beach resort in Seminyak Bali – The W Bali. 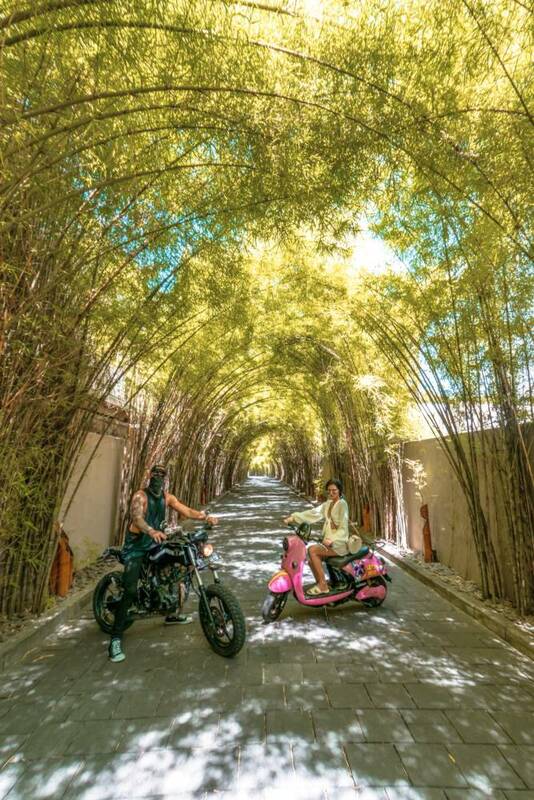 Upon arrival, you enter this beautiful bamboo tunnel which leads you to the hotel entrance and lobby. 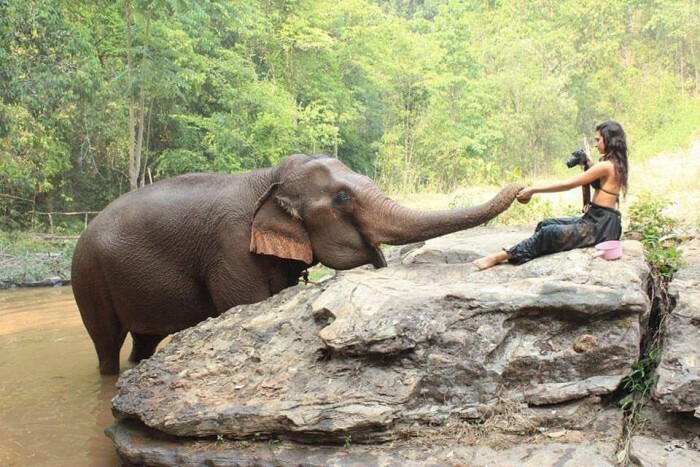 Such a dream. 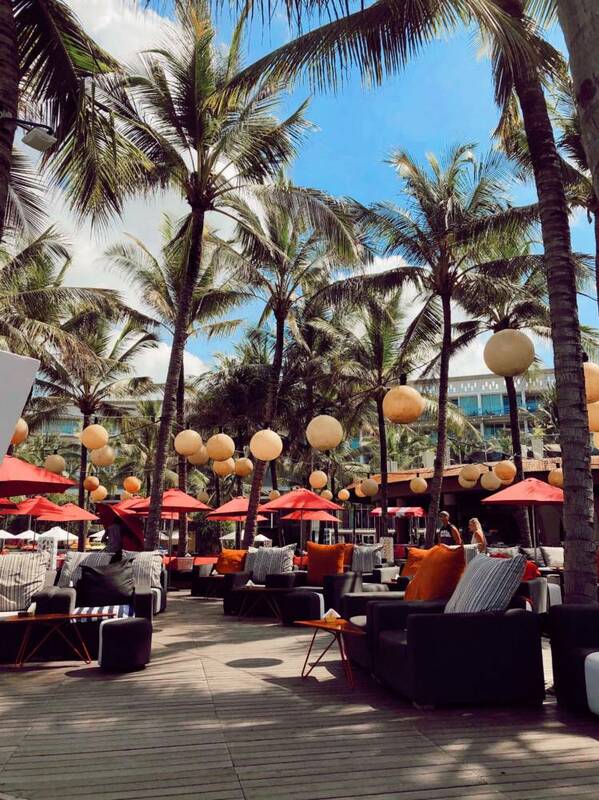 The W Bali is located on the best beach in Seminyak. You can walk right from the hotel onto the sand to watch sunset. 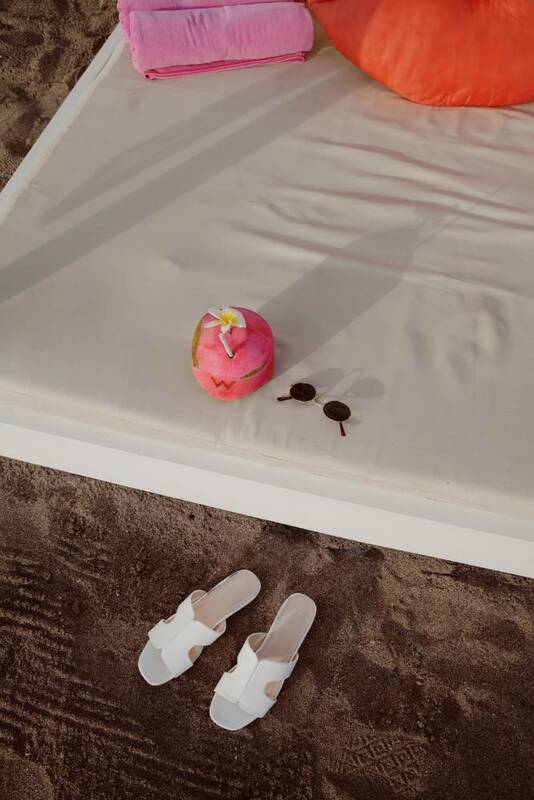 They also have comfortable double daybeds supplied with fun pillows where you can chill too. 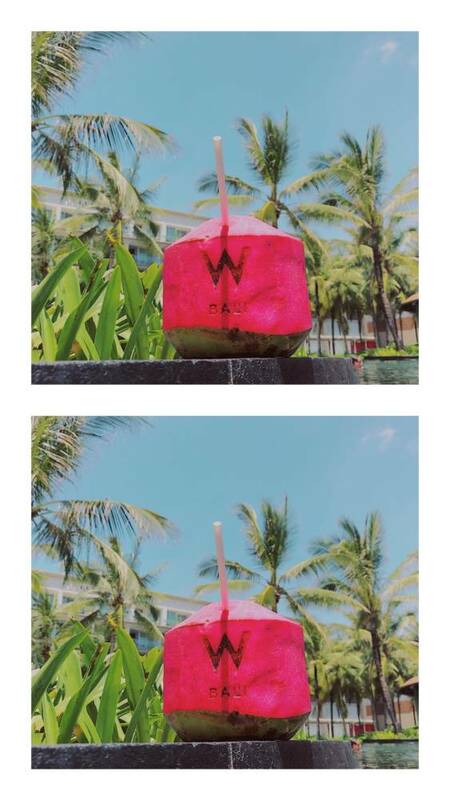 A major highlight of the W Hotel is the beautiful tiered swimming pool, surrounded by palm trees and a beautiful view of the Indian Ocean – perfect for a Bali sunset. We ordered fresh coconuts and juices every day while we hung out by the pool. 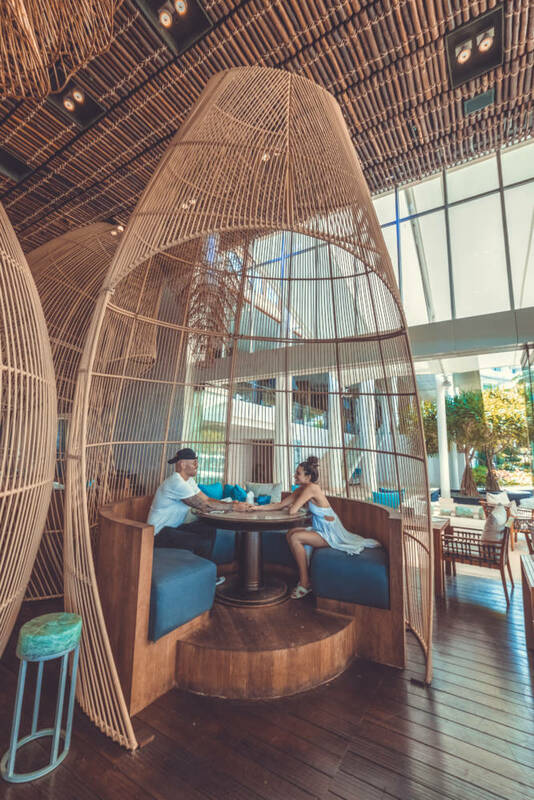 Woo Bar is where it all happens later on, with stunning sunset views and a revolving line up of international DJs spinning the decks into the small hours. 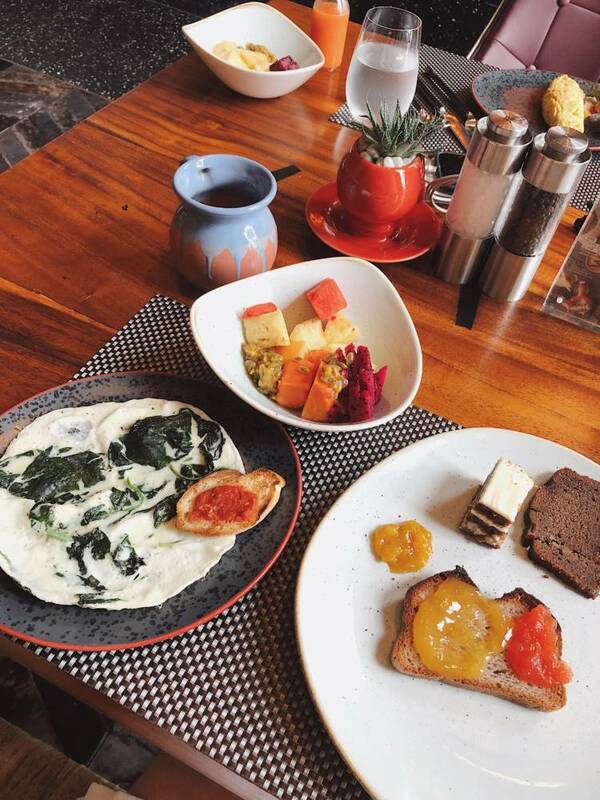 The best buffet breakfast in Seminyak! I couldn’t believe how many dairy and gluten-free options they had. This breakfast really caters to everyone and is absolutely delicious. 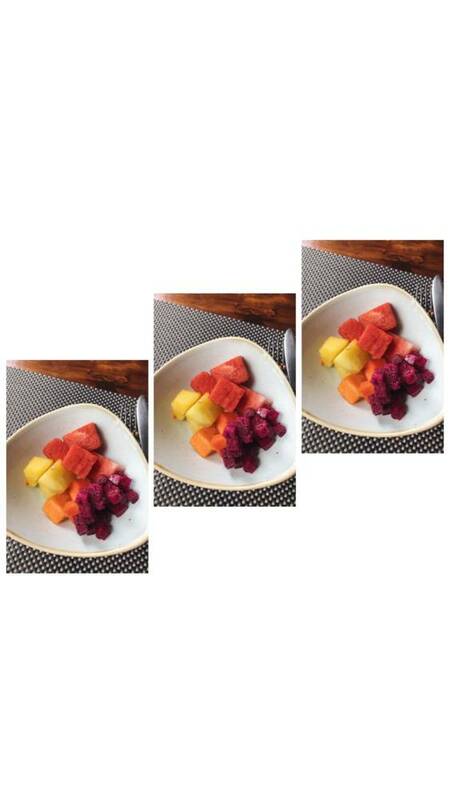 Fresh juices, omelettes, pancakes, gluten-free toast and donuts, etc. – they really have it all. AND they let you pick your own coffee mug from their eclectic collection – so unique and fun. Upon entering your room, there will be upbeat and happy songs playing that just make you wanna dance. 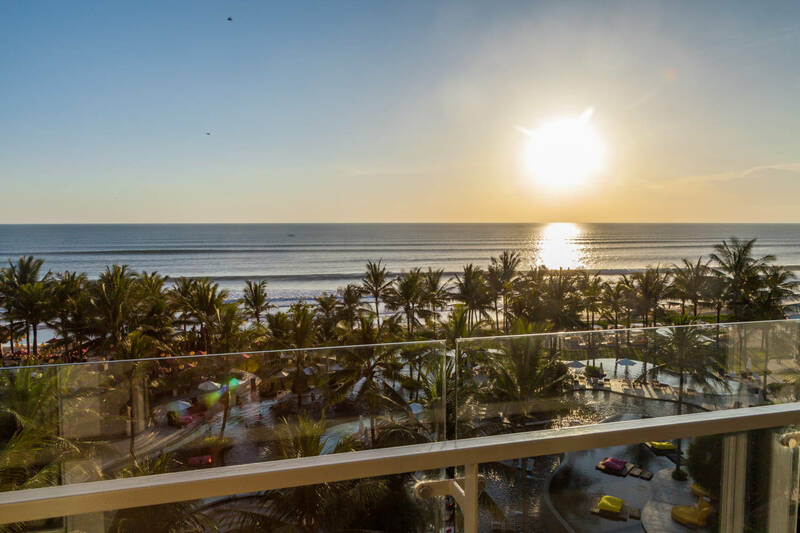 The rooms at the W Bali are so stylish and comfortable, we wanted to move in, but I mean… who wouldn’t with that view? Deciding where to stay during your travels to Bali is an important decision. You want to make sure that the area you’re staying in has everything you’re looking for. 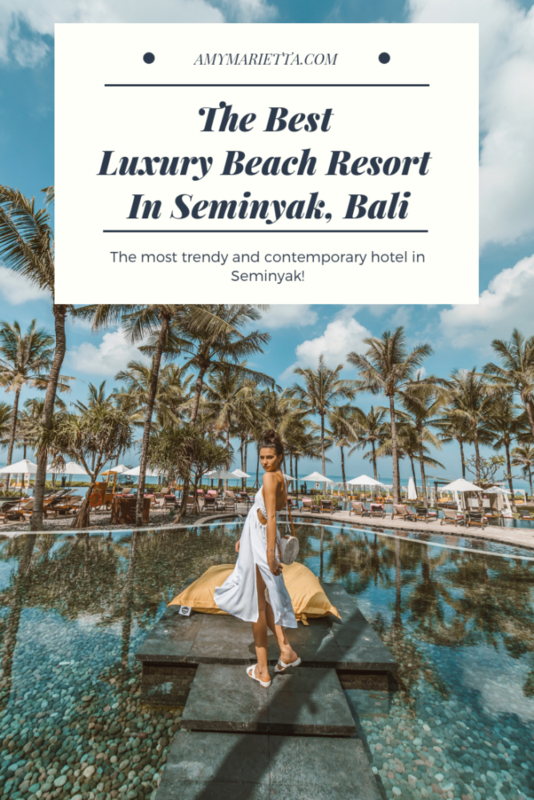 Seminyak, Bali’s high-end area, is best known for its luxury hotels, modern restaurants, hip lounges and clubs, eclectic art, posh boutiques, beautiful sunset beaches, and award winning spas. So if you’re into these types of vibes, then this is the place for you. 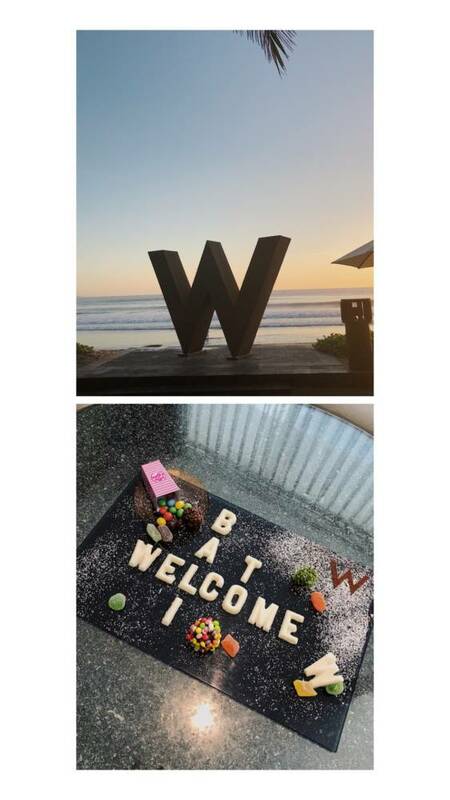 The W Bali has such outstanding service – everyone who works there was so happy and kind to us during our stay. I also appreciate the fact that they have such great security throughout the resort. In this day and age, no matter where you are, extra security is always a major plus. 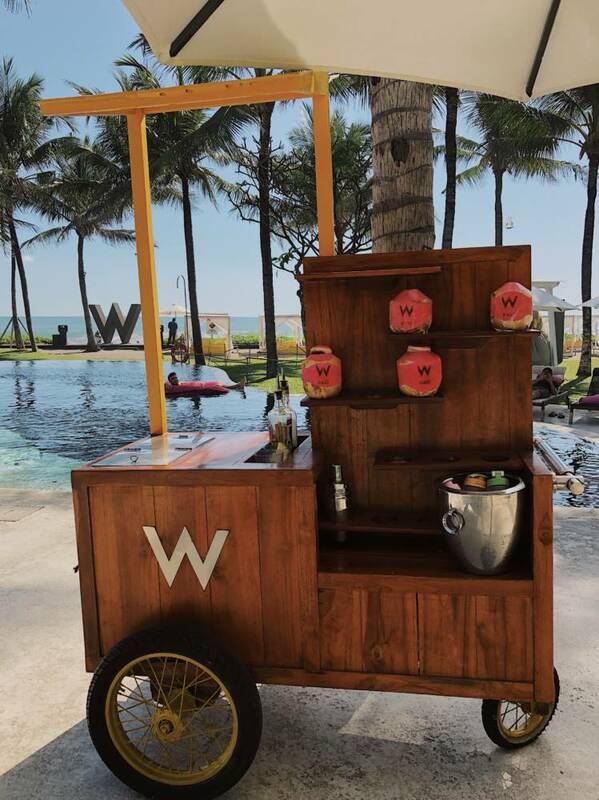 Make sure not to miss the events at the W Bali! They have events every week and fly in DJs from around the world. I love how much they incorporate music into their hotel and support artists from around the globe – so awesome. For daily updates follow me on Instagram @amy_marietta and Youtube.